One aspect of the story of Jérôme Thibouville-Lamy – J.T.L. 's success was the competitors which evolved within the universe of Mirecourt instruments; despite the fact that they stood in the shadow of the Thibouville-Lamy's towering production sites and stores, they still worked their way up to a respectable size. The names of competing companies are still well-known and appreciated, even a half-century after the decline of industrial musical-instrument making in France. Much like the production of stringed instruments at J.T.L., the company run by the Laberte family had deep roots in the region's violin-making tradition and can be traced back to 18th-century ateliers. It was not until the year 1876 that the brothers Maurice-Emile and Pierre Alexis Auguste Laberte, two young violin makers who were born around the time J.T.L. was founded, established their company "Laberte Humbert frères." Looking at the efforts of those who followed approximately one generation shows that the emergence of J.T.L. was the work of true pioneers, and those who wished to emulate them had to approach the scene at a respectful distance. The Laberte brothers chose to focus on a more narrowly defined business sector: they limited themselves to manufacturing bowed and plucked instruments. Their catalogues, which are still very much worth reading today, also featured an extensive line of accessories. It was not until the Great Depression of the 1930s that their product line expanded, although not by taking the next obvious step — i.e. selling musical instruments of other kinds — but by including gramophones and radios, which were sold under the new "Stradivox" brand name. This was an intelligent and unconventional strategy, and it further illustrated how dominant J.T.L. was as an all-around supplier of a broad range of musical instruments. Company growth seemed inconceivable when faced with a competitor of this sort. Despite these constraints, however, Laberte-Humbert frères continued healthy expansion in the first quarter of the 20th century. A number of mergers brought about increases in production capacity, not to mention violin making expertise and experience. The company broadened its portfolio under the management of Marc Laberte, the son of co-founder Pierre Alexis Auguste Laberte. He created a separate series of higher-quality instruments which complemented the factory pieces. The premium instruments were crafted by select masters at an "Atelier Des Artistes," where outstanding violin makers such as Joseph Aubry, Charles Brugere, Camille Poirson and Georges Apparut came together under a highly-esteemed brand. 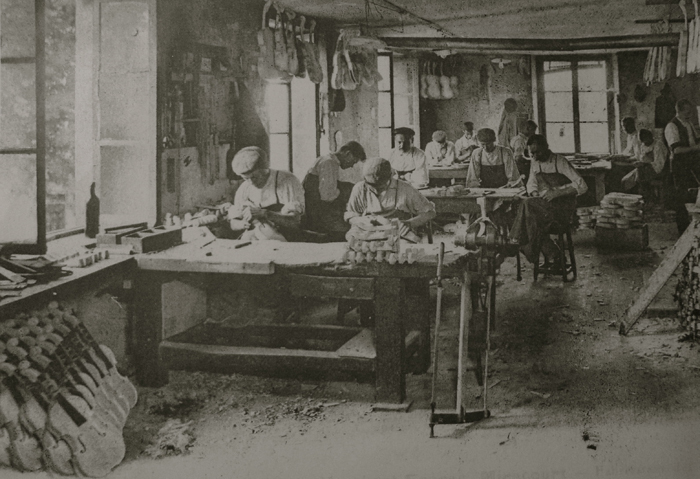 After joining forces with violin maker Fourier Magnié in 1919, the company continued under the name "Laberte et Magnié" and used "L.F.M." as its hallmark – certainly chosen as a deliberate reference to its great rival. Some 400 employees worked at L.F.M. In 1927, the company completed its last significant takeover by acquiring the famous brand "A La Ville de Cremonne" by Paul Mangenot. This was also the last meaningful milepost before the end of the classical musical-instrument industry in Mirecourt.